The United States has the world's largest economy and boasts a lot of rich people who command high salaries. The state of California recently overtook the United Kingdom in terms of economic power, for example. 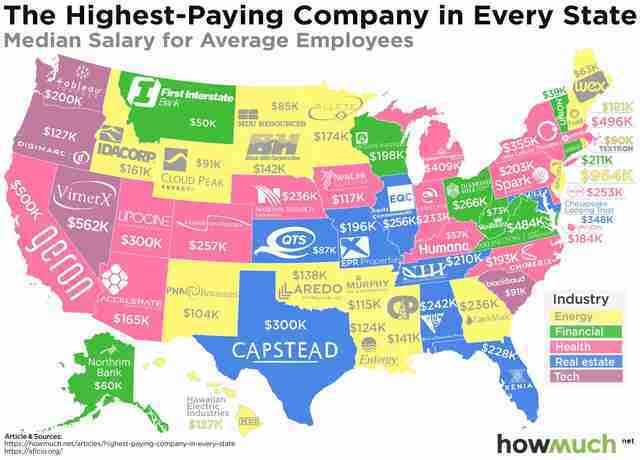 But as a new map from Howmuch.net demonstrates, you'll probably need an advanced degree to work at the highest paying company in your state. To compile the map (shown below), the personal finance site combed through data provided by the AFL-CIO and determined which companies pay rank-and-file workers the greatest average salaries across all 50 states. You'll see the map is color-coded according to each industry, with lots of energy and healthcare companies dotting the landscape. You'll likely notice something particularly strange about the map as well: Many of the companies listed are pretty obscure, as opposed to American multinational banks and the tech giants of Silicon Valley. And of course, predominant state industries play a major part too, as energy companies in the South and Great Plains form a large crux of the territory, while banks are just a paltry sliver. One very important thing to consider about the map: Most of these companies have very small payrolls compared to behemoths like Amazon, Google, Nike, or Walmart. As Howmuch.net concedes: "On average, the top 10 companies listed above only employ 21 people each (that data wasn’t available for NRG Yield). In other words, these are extraordinarily hard jobs to find." In any case, don't expect to polish your resume for an elite research post at an oil and gas juggernaut if you don't have the qualifications. For jobs that don't require a doctoral degree and assumedly a great deal of student debt, this might be more your speed.